Identified on page 138 of Fuller and Gregory's "Japanese Military and Civil swords and dirks" as being a 1934 pattern Army shin-gunto with naval characteristics. 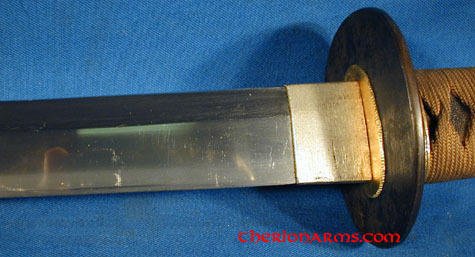 Paraphrased from the book: "The pommel, hilt ornaments, scabbard throat, suspension mount, strengthening band, and chape are all standard shin-gunto pattern. However, the scabbard is wooden with a glossy black lacquered finish over a canvas base, the hilt is covered with a black canvas under a brown tape binding, and the oval tsuba (guard) is blackened steel. 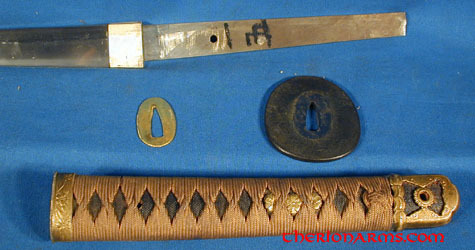 These three features are normally associated with the naval kai-gunto. ... The 'mixed' appearance seems to indicate usage by officers and/or Warrant Officers of the Naval Landing Forces ... However, the use of canvas hilt covering instead of same indicates mid- or late-war production, perhaps as a joint Army/Navy sword ... "